Our trendiest Japanese-language writer Go Hatori is smitten with a beautiful, perfect dessert. How did he get here? Well, he was innocently strolling through the aisles of 7-Eleven when he caught sight of this bombshell, shining redolent among the seasonal ice creams and frozen biscuits. 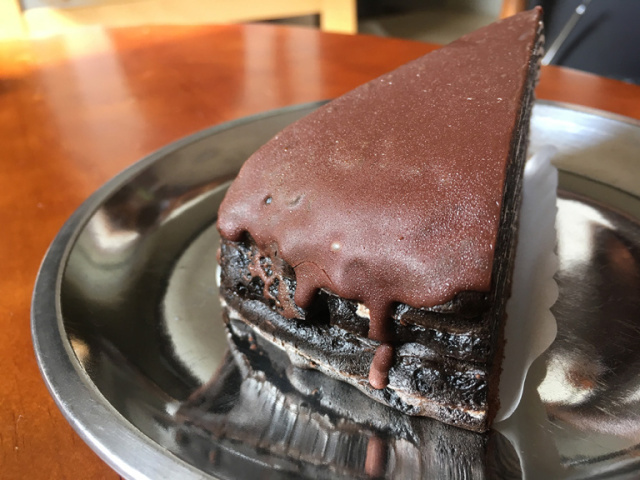 Upon purchasing (and then devouring) the “Crunchy Chocolate Mille Crêpes Cake”, Go was astounded that such a delicacy could be bought from a humble 7-Eleven. Naturally, the taste itself was captivating, but more than that…that glistening sheen… that creamy filling. From the side, her sumptuous layers were highlighted in striking contrast. And this sensual shot from behind. It was no wonder Go was instantly and utterly besotted. You saw it too, right? The mille crêpe cake’s most alluring charm point? 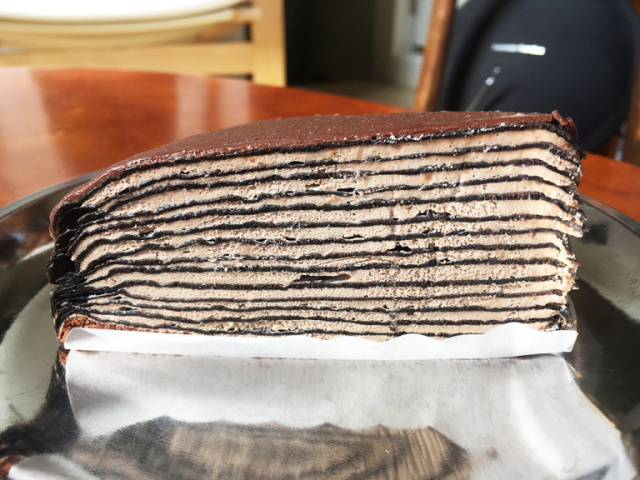 ▼　Fourteen (14) delectable layers of fluffy crêpe cake, interspersed with a delectable chocolate cream. The “crunchy” part comes from the top layer, a solid chocolate topping. This is beautifully illustrated when you cut into it with a fork. Each stratum is so plump and full-bodied that Go really felt the presence of the full fourteen layers. The texture, the flavor, the inimitable experience of biting through those plentiful layers! No matter how Go struggled to find the words to describe this phenomenon of fine dining he couldn’t convey the magnitude of his pleasure. This is a true shining star in the world of convenience desserts, an experience for epicures to savor and relish. Alas, other people seem to have noticed this too. Go noted that this dessert is rarely spotted in 7-Elevens in popular business districts, though people in smaller towns or residential areas may have a higher chance of securing one. If one if in your local 7-Eleven, snap it up immediately. It goes down beautifully with a cup of hot tea, and costs just 276 yen – treat yourself! Wow! That looks good. I may try one on my coffee break one of these days. 7/11 also has some good chocolate chip cookies. That's never a thousand layers! I demand a recount. Wow! That looks great with a latte! It looks reasonably priced. Not my kind of dessert but 7/11’s cheese cake slice with a graham cracker crust is much better than I expected. There was a bit of a craze on regular mille crepes about twenty years ago, mainly because you could get one for about 200 yen at Doutor. You probably still can, I've just not been for years. Anyway, natsukashii.